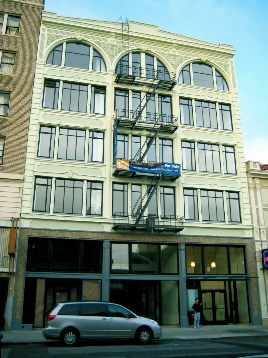 Downtown developer Mo Mashhoon (whose previous projects include the restored Victorian commercial block across San Pablo from the Uptown complex) purchased this decaying office building (once home to Beauty Town and a diner), renovated the structure, and is now selling the office floors as commercial condos. He created a new façade in blue and white with burgundy accents along the roofline and storefronts. The finishing touch was architectural lighting, bringing more than a little panache to City Center. This century-old residential hotel was closed after a fire in 2002, and declared a public nuisance after squatters were evicted later that year. 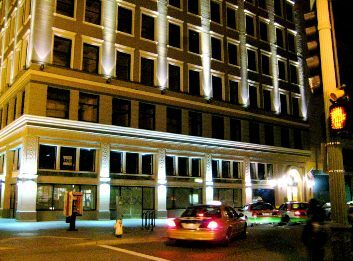 While I have heard nothing since 2004 about possible future uses for this building, a charming, French-inspired yellow and blue façade upgrade has graced the upper floors of this still-closed hotel. 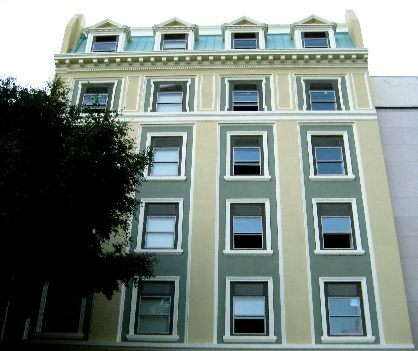 One of three office-to-residential conversions of historic buildings from Brog Properties, the former Golden Bridge Beverage Company HQ was transformed from an abandoned Class C office building to twenty homes, under Oakland’s Live/Work Ordinance. As the building is completed, a delicate sea-foam and crème color scheme highlights the Beaux Arts detailing of the five-story structure. Since I walk down 13th street several times per week, I’ve definitely noticed and appreciated all of these changes. Downtown Oakland seems to become more beautiful every day.